The Community Colors area little something we’ve designed up as a way of rewarding people who are active in the community. By this, we’re talking about people who support all the wonderful players who stream us Twitch.TV, people who participate in tournaments, guide creators, fan artists, and all sorts of other wonderful. We’re planning to give exclusive keys for this special color pallet throughout the course of Open Beta. Here’s the breakdown of how they work. You cannot ask for community colors. There’s no sign-up or automated delivery method. We’ll be giving these to streamers regularly, so if you’ve got a favorite Brawlhalla streamer keep an eye out for giveaways. Each week we’ll be hand delivering a few to stand out players in the community. This can include fan artists, guide creators, ultra helpful people on the subreddit, and other additional awesomeness. We’ll be giving these away on our Dev Stream and on our official Twitter and Facebook. They may randomly appear via other avenues. Keep an eye out! 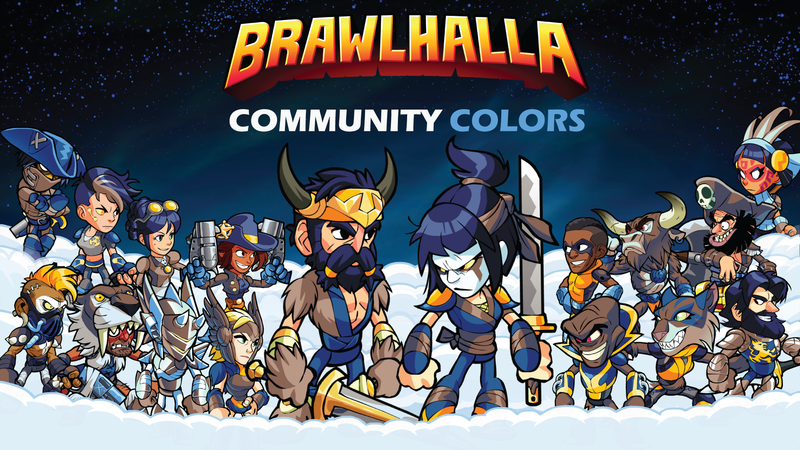 Compared to other games, colors are something that are special to the players of Brawlhalla. While people coming from other games might not ‘get it.’ We know you do. And that’s all that matters. If you are a Content Creator who would like to submit an application for Community Colors you can do so here.